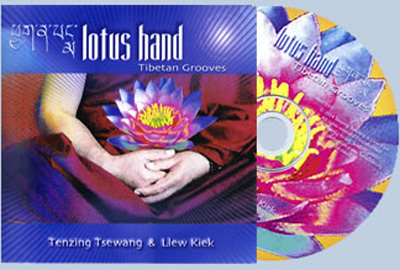 Tenzing and Llew released of their CD “Lotus Hand” in 2004. The album draws on their widely differing backgrounds in folk, rock, reggae, chanting, early music, sampling and sequencing to deliver an aural palette of immeasureable depth. The album features Tenzing's superb and diverse vocal range, from a playful lyricism through rich Tibetan folk textures to his unearthly low monastic chanting. Tenzing is also a master of the unique Tibetan drumnyen (three string lute) which is rarely heard in the west. We hope that this album will reveal it as significant instrument which can be integrated into broader contemporary musical contexts. Together with Llew's virtuosic baglama and electric guitar, the plucked string textures on this album bring Tibetan and western traditions to a thrilling conjunction. This is underpinned by superb keyboard sounds, a vast array of samples, and percussion ranging from traditional Tibetan ritual instruments, Balkan and Arabic drums, to masterful rock kit played by the inimitable Chad Wackerman. It is Tenzing's intention to expand the reach of Tibetan music and art beyond his own circle, making it relevant to the time and place in which he lives. In order for his culture to survive long-term, Tenzing believes it has to be brought into the mainstream rather than be isolated. For that, meeting Llew was a perfect and timely karmic connection. Lotus Hand is a visionary collaboration of Tibetan and Western music. Tenzing passed away in July 2007. He is sadly missed. Proceeds from the sale of this CD assist in the maintenance of a school Tenzing established in his remote family village in Tibet.